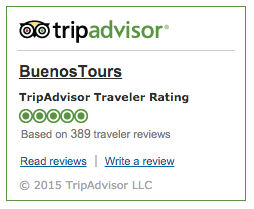 …and TripAdvisor users agree! The most popular travel reviews website has awarded BuenosTours their “Certificate of Excellence” in all seven years our private walking tours have been listed on their website (2011-17). 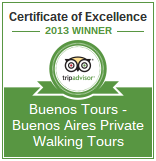 This was the result of consistent fabulous reviews from our delighted clients, that have seen us maintain a perfect 5/5 rating and kept BuenosTours listed as one of the top activities to do in Buenos Aires on TripAdvisor, and the number 1 ranked private tour company in the city! In addition to that, BuenosTours has been recommended or mentioned by guidebooks like Frommer’s & Lonely Planet; media companies such as The Boston Globe, Fox News, the UK’s Independent & South Africa’s Sunday Times; travel industry peers like Delta Air Lines, Conde Nast Traveler, National Geographic Travel & Sheraton Hotels; and has continually received excellent customer feedback online at Cruise Critic & Google Reviews. Frommer’s: In both the Buenos Aires and Argentina guidebooks, BuenosTours is listed as “The Private Walking Tour Specialists in Buenos Aires“. Click here to see our listing on the Frommer’s website (scroll to the end of that page), one of the most respected travel guides around. Lonely Planet: The largest travel guidebook publisher in the world (now owned by the BBC!) 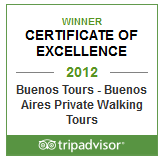 has listed BuenosTours in their Lonely Planet Buenos Aires AND Lonely Planet Argentina guide books. In addition to that, they have also listed BuenosTours in their 1000 Ultimate Experiences book, putting us up there with the most interesting and fun things to see and do all across the world. 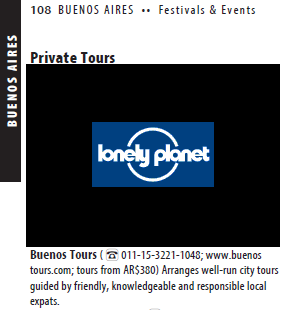 Lonely Planet says that BuenosTours give well-run tours and that our tour guides are “friendly, knowledgeable and responsible”. Their Buenos Aires book also mentions that we have a great website, so don’t forget to check that out too! DK Eyewitness Travel: In their “Top 10 Buenos Aires” guide book, BuenosTours is listed as one of the best ways to get around the city, among their choice of recommended Guided Tours. 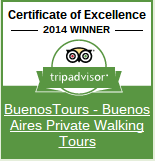 Clients of BuenosTours will know, however, that we are not just “Top 10”, but Number 1! South Africa’s Sunday Times: The largest weekly newspaper in South Africa has recommended our private walking tour services in glowing terms on several occasions, and you can check out one example here on their website (scroll to near the end of that page). The Boston Globe: In their coverage on the city of Buenos Aires, the Boston Globe (owned by the New York Times) mentioned BuenosTours. Check the link here. Clarin: The largest newspaper in Argentina listed BuenosTours in an article on blogs & websites in Buenos Aires, as can be seen on this page on the Clarin website. Sheraton Hotels: The Starwood Hotel group (one of the world’s largest hotel companies, owners of the Sheraton chain) selected our walking tour as a “must see” in Buenos Aires, mentioning that the city is best discovered on foot. Click here to see our listing on their website (scroll down to near the end of that page, under Walking Tours). Delta Air Lines: The world’s largest airline recommended BuenosTours in their Delta Sky Magazine, as offering “some of the best walking tours in all of Buenos Aires“, and also reinforced the notion that walking is the best way to see the city, preferably on one of our tours. Marriott Hotels: The famous hotel chain lists BuenosTours on their website as a thing to do in Buenos Aires, mentioning that “you will see the city up close and personal as a local does, walking and via public transport”. Cruise Critic: Members of the most popular cruise trip planning/reviews website have recommended our tours on many occasions, a couple of examples being these two frequent posters, one writing that BuenosTours provided “one of the best private tour guides of the whole cruise” and another member who stated that their tour with us was “one of the highlights of the trip” on their Veendam cruise. BuenosTours private walking tours are perfect for cruise passengers that don’t have much time in the city and want to make the most of it. Google Reviews: In addition to being listed by the Google directory dmoz.org, BuenosTours have a near-perfect rating of 4.7 out of 5 with Google Reviews. See here for the reviews and ratings on Google. One client mentioned that “the tour was incredibly interesting and informative, and the guide really managed to bring the city to life… we got the insider tips on where to eat and what to do on the rest of our holiday.“. Matador Trips: The largest independent travel publisher online recommends a private walking tour with BuenosTours as Day 3 of their “5 Unforgettable Days in Buenos Aires“, to help you get the most out of the city in a short stay. 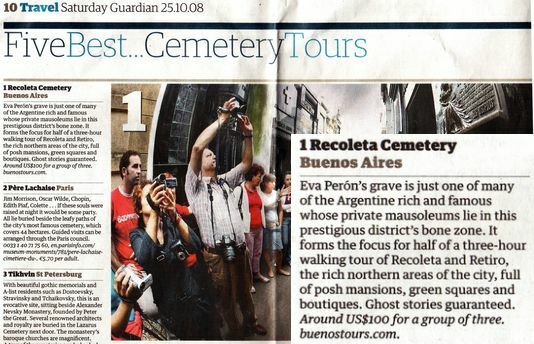 TravelPod: Travelers using “the web’s original travel blog” have written reviews of our tours in the past, an example being this overview of our Recoleta Cemetery tour with lots of fantastic photos that will give you an idea of the stunning sights you’ll see along the way. For more great feedback on our tours, check out our client testimonials page!